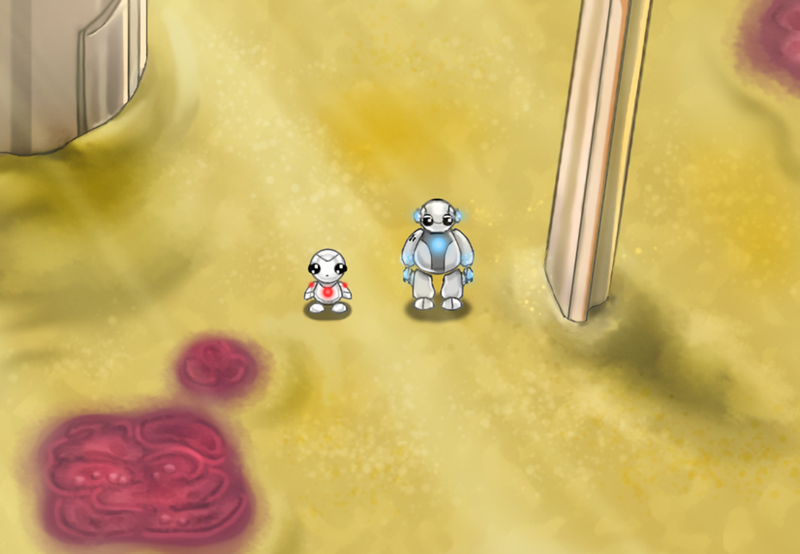 Wanda is a story-focused puzzle game for PC about two lonely robots finding hope and friendship on a ruined planet. 128 backers pledged AU$ 2,887 to help bring this project to life. Initial Funding Goal has reached! More stretch goals unlocked! Please scroll down to see them. "Wanda is a story that's being told through a digital medium that just happens to be a game." You've played many post-apocalyptic games where you have to fight though hordes of zombies, and epic games with tales about treachery and bravery. But what about a post-apocalyptic world filled with friendship, hope and child-like innocence? 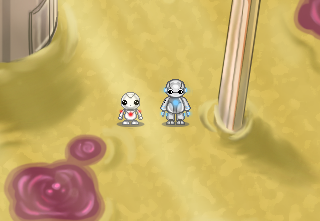 Wanda is a short and simple story about two lonely robots in a desolate and ruined world. Unlike many other ‘end-of-the-world’ themed games, it is not a tale about desperate survival or heroes saving the world. Witness the story unfold, solve mini-puzzles and join this little adventure. Experience a whole new perspective of a ruined wasteland through a charming art-style reminiscent of a children’s book and delightful soundtracks. We aim to make Wanda a simple, pleasant and a very personal experience for you. A simple story about friendship and finding happiness. Wanda's story is modest and very easy to follow. It's about a robotic life form that wakes up from a long slumber and finds itself trapped in a bleak wasteland with nothing but sand and stones. It feels lonely. It yearns for someone, anyone. Day after day, it searches for other survivors, yet finds none. It has lost all hope… ...until one day, it finds a small robot asleep in a pod and very much alive. The peculiar duo bond very quickly. The only thing they have in this empty world is each other. Simple and child-like, they are easily excited by objects in the environment that we would typically consider insignificant and find happiness in those small things; like drawing, or gazing at the moon. Their endless journey becomes more meaningful now that they have each other to look after. However, nothing lasts forever. Will these robots be prepared for the cold reality that awaits them? Wanda is a story-focused game but completely free of comprehensible dialogue. The entire story is told through the subtle interactions between the two robots and the environment itself. We aim to have you experience a story, transcendent beyond words, in a “show, don't tell" style that will affect you emotionally as you dive deeper into the it. To enhance the game play, we've added several puzzle elements for you to solve. The puzzles will be as simple as moving rocks to navigate ones path or more challenging logic puzzles that require the cooperation of both robots. Enjoy a well-balanced pace between puzzles and story to immerse yourself into a unique gaming experience. Let's solve this puzzle with... guns?! We've also made a short comic based on the game and it will be available to purchase along with the game. However, the uncompressed ultra hi-quality digital version (~4700 x 6700 pixel and 400 dpi) and physical paper-back version of the comic are exclusive to Kickstarter and will not be available elsewhere. Wanda comic physical version (Sample). Here are some of the beautiful tracks composed by David for the game so far. Please stay a while and listen. Now, the most interesting part! We've prepared exciting rewards just for you. Please take a look! General Disclaimer : We retain all rights to decide what content goes into the game. Regarding customized content, we will discuss it with you to make sure we present your idea in the best way possible. As a general rule, the concept must not be offensive in nature. Here comes the boring part! We're a minuscule team of individuals from various parts of the world. We have released a commercial game in 2014 on Steam called DarkEnd, a traditional dungeon-crawler and rogue-like hybrid. We are mainly interested in old school RPGs and dungeon crawler types of games. However, Wanda is a special kind of game! We are all very passionate about game development and take pride in what we create! Now, you may be asking why we are doing this Kickstarter. Kodots Games is a small, self-funded independent team and already has a firm plan to bring the game to reality. Being a wordless story-focused game, Wanda needs beautiful music to enrich the storytelling. With David's help, we are already making a wonderful soundtrack for Wanda. But we'd like to add more than that. Instead of reusing the music, we'd like to have unique tracks for each scene. We'd like the music to evolve along with the story and characters in game. Our game is small and we don't have any unrealistic stretch goals. We will use the funds for Music and SFX. A smaller portion will be reserved for minor taxes & fees. If the Kickstarter is more than successful, we will be able to expand the game even more, all thanks to you! We've met our funding goal! Thanks for all the support! It's time to reveal more stretch goals. Please take a look. The final hidden stretch goal will be revealed once all goals are met! Have you watched the new Star Wars? Go and watch! It's really great!!! A-ahem... Anyway, we want the big bot and the small bot to have their own custom emotive "beep" and "blip" SFX like the famous R2-D2 and BB-8 from Star Wars. It'll greatly enhance the experience, no doubt. Help us reach the goal, let them speak to your soul! Once we reach the 5800 AUD goal, Wanda will be "remade" with a newer, more powerful engine. This will allow us to use hi-definition images with better resolution. Note that it'll be an entirely new game. Current version of Wanda will be released first. All the backers from 7$ tier and above will get the enhanced remake of Wanda once we finished developing it with no extra charge. It will be released for both PC and Mac, unlike original version which is for PC only. Please, take a look at possible graphical improvements here. The enhanced remake will be ported to both iOS and Android platforms. Take Wanda and enjoy this little adventure everywhere and anywhere!!! With your involvement, we can deliver Wanda in the best way we possibly can to you! Unless there’s an apocalypse on Earth and we’ve all been enslaved by robots, the game will be made and finalized. Game development is a long and tiring process and there may be unforeseen events hindering our process. But luckily, we have a great team of people working in perfect sync! We have already released a game on steam and various digital download stores before so we have a good idea about how long a game takes. In other words, you have nothing to worry about. The game will be delivered as promised if our campaign is fully funded! Thank you all again for your support and showing interest in our game. We hope to collaborate with all our backers. Let's make Wanda happen together! Thanks for showing us your support! You will receive our sincerest thanks, HD digital wallpapers of Wanda and be credited in game as a proud "backer" of this project. You will receive a digital copy of the game at a lower cost as well as HD digital wallpapers and be credited in game as a proud backer of this project. You will receive a digital copy of the game as well as HD digital wallpapers and be credited in game as a proud backer of this project. You will receive all previous rewards PLUS artwork, original soundtracks and a digital copy of Wanda comic. You will receive all previous rewards PLUS artwork, uncompressed hi-quality original soundtracks and a Kickstarter Exlusive, full-sized, digital copy of Wanda comic. You will receive all previous rewards PLUS artwork, uncompressed hi-quality original soundtracks and a Kickstarter exclusive, full-sized, digital copy of Wanda comic. You will receive all previous rewards PLUS a Kickstarter exclusive version of the game with special outfits for both of the main characters. You will receive all previous rewards PLUS two more digital copies (3 total) of the game to share with your friends and family! You will receive all "Standard" Rewards PLUS your very own exclusive DRM-Free version of the game with your name shown on the game's title-screen. You will receive all "Standard" Rewards PLUS an exclusive opportunity to access the beta version of the game. Get involve with the game development with your beta-testing and feedback. You will be credited as a "Beta Testers" in game. You will receive all "Standard" Rewards PLUS a Kickstarter exclusive, limited edition, paper-back copy of the Wanda comic. We will ship comic to anywhere free of charge! Enjoy your limited edition physical comic! You will receive all "Standard" Rewards PLUS an exclusive opportunity to design an in-game collectible and you will be credited as an "Item Designer" in the game. The item you design will be shared with the world! Make it awesome and make your mark in the game! You will receive all "Standard" Rewards PLUS an exclusive opportunity to design an exploration stage and you will be credited as a "Map Designer" in the game. Let your creativity go wild and design your very own map/stage that the players can explore! You will receive all "Standard" Rewards PLUS an exclusive opportunity to design a complete puzzle stage/map and you will be credited as a "Creative Team Member" in the game. An exploration map not enough? Take a step further and be the mastermind behind your very own puzzle map and challenge the players! You will receive all "Standard" Rewards and "Exclusive" Rewards PLUS your portrait will be in a very memorable scene in-game! You will also be credited as 'Executive Producer' of the game! Make the greatest mark in Wanda! Be the one and only to get all exclusive rewards! Design your own collectible, an exploration map, a puzzle map, get your own physical Wanda comic AND your portrait as a memorabilia in the game!